Thank you Celeste and Happy Belated birthday. I think it is a beautiful card, Hallie. I love your little main street and all its Christmas beauty. Even Santa had to walk through town. I hope all is well with you and your family and wish you a very merry holiday season. Hi CrimsonLeaves. I hope Santa makes a right at the light and finds my house. Merry Christmas. Have a very merry Clarkesville Christmas and a happy new year! I love the card - it is a delight. It has been a joy following you and your art over the years, and I look forward to the next wonderful year. Thank you Dan. I look forward to more paintings (and at least a few dark ones) and writing from you. 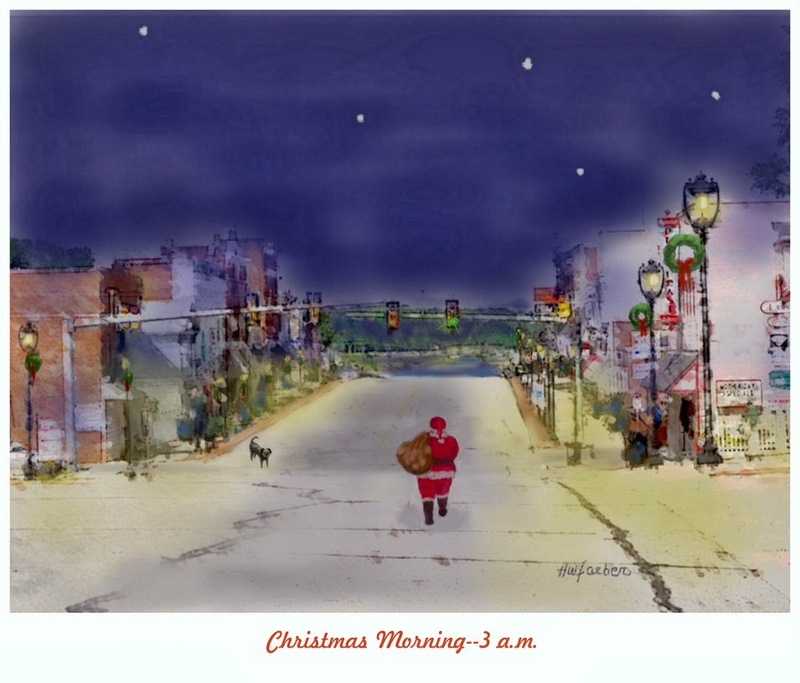 A very nice Christmas card - and so special that it's your town. Love the little black dog, the first one to see Santa :) Have a wonderful 2014!!! Thanks Rhonda. Here's to a great 2014. It is a beautiful card with a wonderful sentiment. I can see how it touched so many people. Thank you for everything Hallie- your sharing of art and your friendship. You hope to be blogging more and I plan to be blogging less. But I'm still around and love getting your blog updates in my email. Feel free to drop a line anytime. Know that I'm watching. Hey PAMO--you've already been blogging less. I'm sure your holidays were busy, but I'm betting something BIG has replaced blogging--we'll wait. Thank you. Happy New Year to you, Sue. It's a lovely Christmas card, so peaceful and it somehow sets you back in time. Wish you and your dear ones great 2014 . Thank you Jane. It does seem to be set back in time. Although the street lamps and traffic light are relatively new, the buildings are the same as when I was a child. This is a lovely Christmas card . All the best for this New Year and more time to paint and draw. Welcome, Helen, and thank you. Beautiful paintings on your blog, and I liked your Christmas cards; especially, the one with the small bird. Baeautiful, Hallie. I am in awe of your facility with the latest electronics. You touched my heart. God bless! Thank you Mary. I fiddle around and find a way to do things; not necessarily the best or most efficient way. Art has so many faces. This is a fantastic Christmas card. And although I didn't understand a word you said about the process (can I come for computer lessons?) I think you did a great job. Thanks Carol King. By the time you arrive for lessons, I will have forgotten how I created this. Charming card and verse. I know your friends and family enjoyed receiving this. Looks like we are all going digital now. I don't have an iPad yet. Not sure I'll get one as I have so much invested in my desk top computers. Good seeing your work again. I must find you on FB. Hi Eva. I think that years of playing around with Corel on my desktop gave me a slight edge with apps. My problem is stepping away from the iPad--it's habit-forming and a time-waster. It is a stunning card you made Hallie. Though the process seemed complicated for my intelligence, I am curious to learn it if I get a chance. Wishing you a great creative year ahead! Thank you Padmaja. I always enjoy seeing your peaceful paintings; Happy 2014.